Flocks of owls are to be seen in Gorey this week, according to unconfirmed reports. 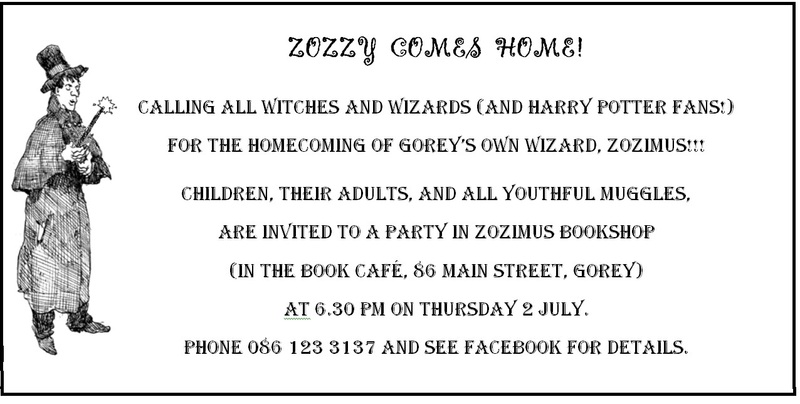 The birds are said to be delivering leaflets around the town, warning residents about a meeting of wizards in Zozimus Bookshop (in The Book Café) at 6.30 pm on Thursday 2 July 2015. The event marks the opening of Gorey’s first Harry Potter exhibition and sale. We have obtained one of these leaflets (see above). Zozzy himself will be present, and will talk about his travels, from the village of Hogsmeade to the land of dragons in Romania. All children who like Harry Potter are invited to come and try some magical nibbles, and a glass of butterbeer. There will be lots of Harry Potter things to see – from models to games, from special magic watches to jewelled Time Turners. And of course lots of books! If you come wearing wizarding clothes, you may win a prize!!! All welcome – entry is free. We are hosting a wine reception to celebrate the launch of Peter Wyse Jackson’s extraordinary Ireland’s Generous Nature: The Past and Present Uses of Wild Plants in Ireland. It will be held on Thursday, 14th August, 1014 (7.00 pm) at Springmount Garden Centre, Ballycanew Road, Gorey, Co Wexford. Peter will be there to sign copies (including the lovely leather bound limited edition of this essential – and very beautiful – reference book.) All are welcome.